When most homeowners think about skip bins, they generally think of industrial sites and businesses. The truth is, skip bins can be used by residential homeowners during various cleanup tasks. If you are renovating, remodeling, adding extensions to your home or doing a massive landscaping upgrade, you can use a skip bin. Before ordering a skip bin, there are four things you need to consider. The first consideration before you order a skip bin is the type of waste you have for disposal. There is a misconception that skip bins hold all waste and it doesn’t matter what you toss out. The truth is, there are different types of waste and each type of waste has a form of skip bin to handle it. The skip bin that is chosen will be emptied and disposed of based on the type of waste it handles. If you are doing a landscaping project, then you will likely be dealing with green waste. Green waste consists of limbs, grass clippings and other natural waste from your landscape. You may have general waste from cleaning out a home, such as appliances and furniture. Other types of waste are asbestos, brick and heavy waste like soil and concrete. You may think the placement of a skip bin doesn’t require much thought. What you need to consider, however, is accessing the skip bin. For example, you may say that you want the skip bin placed on your driveway for household waste removal. This may seem like a good location, but consider accessing the bin. Consider how you will get the waste to the bin. If you will be dropping it from a second story, you will need a chute. You need to consider if the chute placement will work for not only the skip bin but also for your daily life as you come and go from the house. The size of the skip bin will be a consideration that may get confusing. It’s hard for many people to estimate the amount of waste they may have before the project even starts. The estimate can be based on trailer amounts. If you are getting a skip bin that is 1 cubic meter, it will handle around a trailer-sized load of debris. If you are handling rooms in a home renovation or remodeling, then you may want to consider 1 cubic meter per room to handle the full amount of waste disposal. If you will be handling mixed amounts of waste, such as a landscaping project combined with a home renovation, then you may need much larger skip bins. Remember, mixed waste skip bins will also be available in larger sizes to help accommodate your needs. You can share your project ideas with a representative to gain a better idea of the size you will need. A final consideration regarding skip bin hire will be how long you will need the skip bin. Keep in mind that not only will the price go up for longer durations, but you may have to include multiple bin clean-out times as well. For example, if you are cleaning out a home you may need several days to complete the task. You may also have filled the bin several times over during this time frame. Make sure you consider the length of time you need as well as weather and scheduling issues and book a time according to that amount or a little longer. This will help reduce extra fees and ensure you have the skip bin for the time you need. 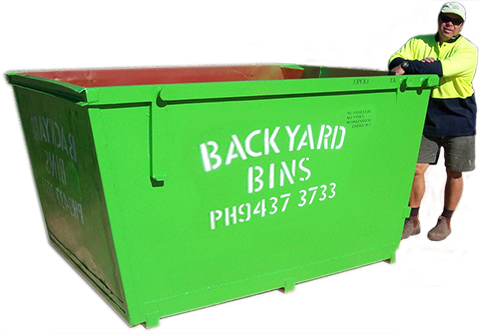 Once you have taken these key points into consideration, contact Backyard Bins. We can help you with pricing, ordering the right size or questions about booking your skip bin. We can also help you if you may need multiple bins for the materials you have for disposal.